When education matters the most, the teacher matters the most too. 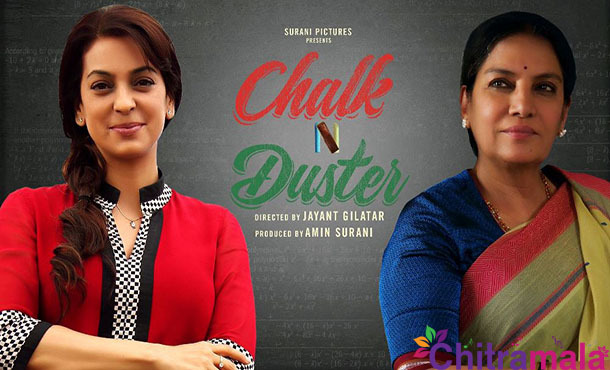 Based on such concept is ‘Chalk N Duster.’ Juhi Chawla and Shabana Azmi are playing the leading roles in this emotional drama. Now the makers released the trailer. Chalk N Duster is based on an emotional journey of two teachers from a school in Mumbai Metro city. These two who strongly believe that nothing matters when it comes to quality education will be overplayed by a cunning principal who replaces experienced teachers with fresher’s, thereby affecting the quality of teaching. Vidya (Shabana Azmi) and Jyothi (Juhi Chawla) fight against this foul play. Juhi Chawla was last seen in Gulaab Gang also starring Madhuri Dixit that released in 2014. This film is directed by Jayant Gilatar and is produced by Amin Surani. Hollywood production house Sony Pictures is making a comeback with Chalk N Duster. Its last release was ‘Saawariya’ that came in 2007. Apart from Juhi Chawla and Shabana Azmi actors like Rishi Kapoor, Jackie Shroff and Richa Chaddha are seen in special appearances. Chalk N Duster will be releasing on 15th of January next year.